Auburn QB Cam Newton Cleared To Play By NCAA : The Two-Way While the star athlete's father and another man "worked together to actively market the student-athlete as a part of a pay-for-play scenario," there is not sufficient evidence to say Newton was aware of what they were doing. 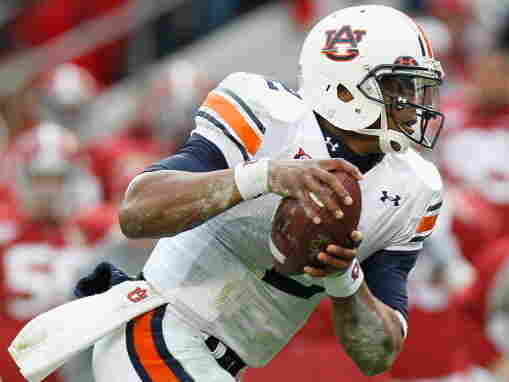 Auburn University quarterback Cam Newton "is eligible to play in the SEC title game, even though the NCAA says his father broke rules by shopping his son to another school," the Associated Press reports. "According to facts of the case agreed upon by Auburn University and the NCAA enforcement staff, the student-athlete's father and an owner of a scouting service worked together to actively market the student-athlete as a part of a pay-for-play scenario in return for Newton’s commitment to attend college and play football. NCAA rules (Bylaw 12.3.3) do not allow individuals or entities to represent a prospective student-athlete for compensation to a school for an athletic scholarship." "Based on the information available to the reinstatement staff at this time, we do not have sufficient evidence that Cam Newton or anyone from Auburn was aware of this activity, which led to his reinstatement." As NPR's Mike Pesca told us a few weeks ago, whether you believe in Newton's innocence or not often depends on which college team you root for. Auburn, undefeated at 12-0, is ranked No. 1 in the BCS standings and No. 2 in the AP Top 25.